The village I live in has no pub, no shop - no focal point at all. Days can go by without me seeing any of my neighbours, which can make working at home rather lonely. 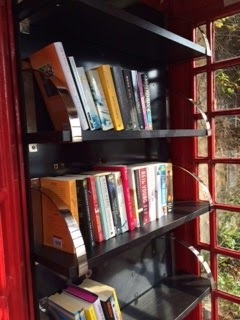 I was musing over this with a friend one day and we came up with the romantic idea of turning the village phone box into a mini library in an effort to bring people together. Little did I know that it would take a whole year to get the project off the ground. 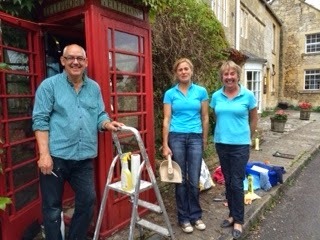 BT are keen to get rid of the responsibility of maintaining the old-fashioned red phone boxes, as they are costly to keep smart, and of course so few people use the phones these days, that the cost of keeping the lines open is a waste of money as well. I discovered that it was possible to 'adopt' a kiosk for the princely sum of £1. BT would then come and take the phone out, leaving me free to put up shelves and fill them with books. Sounds easy, right? Well . . .
First I had to contact BT through their website to ask for a contract. I had to do this before I could send my £1 anywhere. For weeks I tried filling in the appropriate page on the website, only to have it crash every time. I asked other friends to try via their laptops and iPads, and they all had the same problem. I ended up Tweeting 'Trying to contact @BritishTelecom to adopt a kiosk, but website keeps crashing'. Funnily enough, I received a response within the day asking me to DM my request. Public shaming gets you fast results. It turned out that was only the start of a set of hurdles I had to conquer. To get the contract signed and approved, I was told I had to have the signature of someone on the village committee, as the committee is a registered charity. Fine, I thought, I know a few people I can ask. However, at first no one was willing to do this, as they were worried about Public Liability Insurance in the event of anyone using the box having an accident, and the village fund could not cover the cost of this insurance. I also began to receive negative comments from some neighbours who thought that a phone box full of books would be set on fire or used as a urinal. I was told to contact the local Parish Council to get permission to use the box as a library before anyone would sign the contract, which, to complicate matters further, is in the next-door village because our village doesn't have a church. By this stage, I felt as if I were lost in the corridors of the Circumlocution Office. 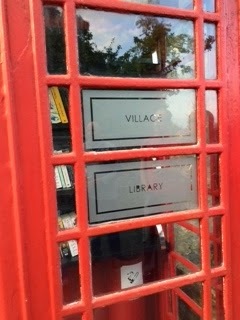 Finally I got the contract through and, with the help of my friendlier neighbours, was able to spend last weekend cleaning the box, putting up shelves and attaching stickers to the windows saying 'Village Library'. An invitation went out to everyone in the village to come along at 6pm on Sunday to have a glass of wine and fill the box with books. Congratulations on a job well done! It looks friendly. Long may it remain that way. Congratulations on sticking at it, Anna! It looks great! Excellent! Thanks for telling us about this. Thank you, all! I shall certainly send an update. Let's hope it's all good news! That is brilliant! Very impressed with your persistence - it would have been so easy to give up. A wonderful story of determination.